Please fill out our secure online Professional Roofing Quote form for quick friendly free estimate. (602)-The-Roof. 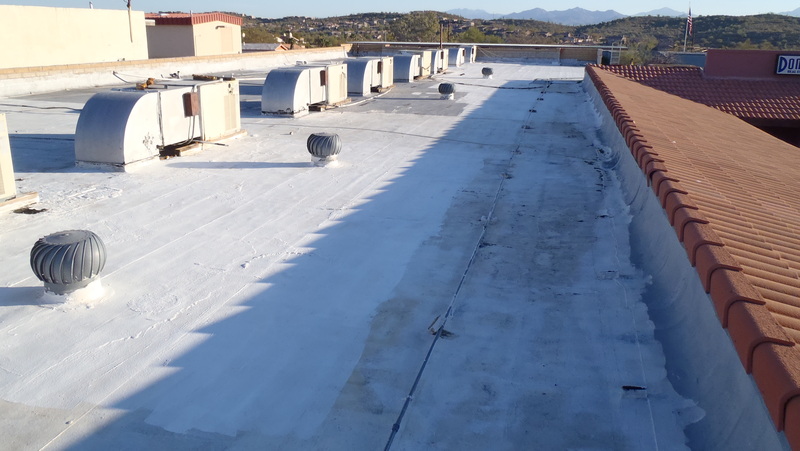 First of all, the core of the Arizona Commercial roof maintenance plan is the semiannual inspections. In our market, Triangle Roofing knows that Arizona commercial roofs can see extremes. Yearly from snow, heavy rain, high winds, and large hail. While depending on the roof types these elements can be quite problematic. Since it’s important to have inspectors trained for storm damage forensic’s. Most damage is systemic with all roofing system types. A proper diagnosis will save property owners untold dollars. First of all, roof insurance rates reflect the effectiveness of the Commercial maintenance plan. Due to more claims that un-maintained roof need. Hence causing the rates to climb up. Depending on the insurer, a maintenance plan from a well certified roofing company can decrease roof insurance rates. Through timeline documentation and roof inspections. This can mean a savings that pays for the maintenance plan plus some. A bi-annual inspection and proper insurance claim advocacy from a commercial roofer. Consequently can produce less and more effective claims. First of all, commercial roofing is not a single piece. Because it is a coordinated system to prevent leaks and protect your business. It includes flashing, mechanical and chemical fastening, insulation, drainage and more. More so, a good reliable commercial roofing partner will keep the business open. Seeing to the roof repair and up keep of all of the parts that comprise a roofing system. More so will head off roof water leaks which can wreak untold damage. More so roof maintenance inspections can end with the result of a full roof replacement there may be hidden benefits. A maintenance plan will keep a strong timeline of photos and notes about a roof and its proper upkeep. First of all, should disaster strike and a roofing system is compromised by collapse. Or product failure, your commercial roof maintenance will likely be able to help effectively. Consequently proper insurance claim handling will make emergency repairs much faster. Most of all getting the property in working order much more quickly. Hence hiring someone that hasn’t documented the roof. Most of all with proper roof maintenance. As a result the documentation finds Mother Nature the blame and the roof is replaced for nothing more than a deductible payment. A maintenance contract with a skilled commercial roofing contractor typically pays for itself by preventing damage. Since property managers/owners agree that heading off possible problems is good business. Since this includes implementing better drainage components without building up sealants in low lying areas. Adding more rock to built-up roofs, replacing rusted out vents. In addition replacing the small stuff that looks like it may fail before it actually has. As we stated in the beginning, a maintenance plan is all about avoiding the inevitable replacement. Another adding years of useful life to a commercial roof lowers the average yearly investment of the roof. Spending small amounts to steadily maintain a roofing system. Therefore accomplishes all the above and is a major savings to any property owner. Copyright © Triangle Roofing Company.